What a traffic jam! Photo by National Geographic. 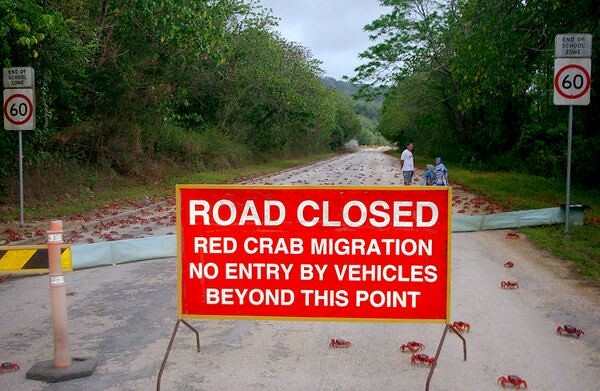 Every year, Christmas Island's 50 million red crabs migrate to the sea to lay their eggs. SOME BIRDS, FISH, TURTLES and whales travel enormous distances when migrating to find food or to mate. The furthest may be the bar-tailed godwit, flying over 10,000km from New Zealand to Alaska. Starlings use a Sun compass, which means knowing the time so as to compensate for the Sun’s changing position. By contrast, mallards can find north using the stars, an ability that is genetically programmed. Many other birds as well as salamanders, salmon and hamsters use the Earth’s magnetic field. Loggerhead turtles can even sense the direction and strength of Earth’s magnetic field soon after hatching and later use this skill to navigate along their regular migration route. Other animals use land features such as mountain ranges and rivers, and dolphins use the shape of the ocean floor. Wildebeest follow the scent of rain and salmon use smell to return to the very same stream where they were born. Ketam di Christmas Island ni memang popular. Wow, that is a lot of crabs! I'm glad to see there is a sign to warn people. Happy New Year to you too!